So, last spring, I did some test-crocheting for my friend Mary Beth Temple. I was working on squares for a booklet she had written, to be published by Leisure Arts. Fast forward to about a month ago, and MBT blogged that her book was out. My (signed!) copy arrived while I was in Omaha. See that afghan on the cover? That’s the one I did! Well, I did the squares – MBT assembled it and did the border. Can I tell you what a neat feeling that is? 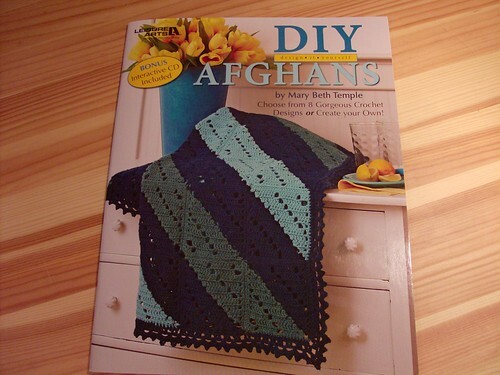 It’s a great booklet – crocheted afghans based on quilt square patterns! And lest you think all crocheted afghans are in acrylic, the one I worked on was done in Cascade 220. It’s got to be awesomely snuggly now that it’s assembled. The book has 8 different patterns, plus a bunch of stitch pattern and block ideas, and a cd so you can design your own. Congrats, Mary Beth, on a great booklet! Oh, and I decided to go with the two-ply, since that was pretty much the overwhelming response. I plyed it up last night while Kris was stuck at work (until midnight – ugh) to a soundtrack ot two old favorite movies – The Adventures of Priscilla, Queen of the Desert, and Girls Just Want to Have Fun. (Why yes, I DO have a stash of “Movies for nights when Kris isn’t here”. :D) I now have a very full bobbin. I’m pretty happy with how it turned out, especially because I wasn’t paying attention when I started and was plying my two S-twist singles with MORE S-twist. Not so good. I hadn’t gotten TOO far when I caught that, so I pulled it back off the bobbin and respun it going the right way, so it’s all fixed. 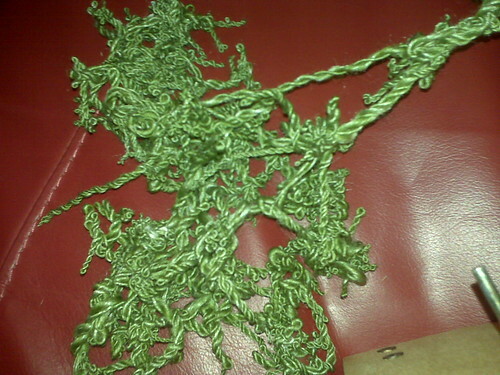 July 7th, 2009 | Tags: Crochet, Friends, Spinning | Category: Misc. 5 comments to How Cool Is This? Very cool! You’re a cover girl! OMG, I love Girls Just Want to Have Fun! Dancing, 80s, and a buncha stars before they became stars. It’s a magical combination! I’m going to have to hunt down a copy of that booklet. Congrats on being on the cover. Easy breezy cover girl! I like the way she joined them. Nice! 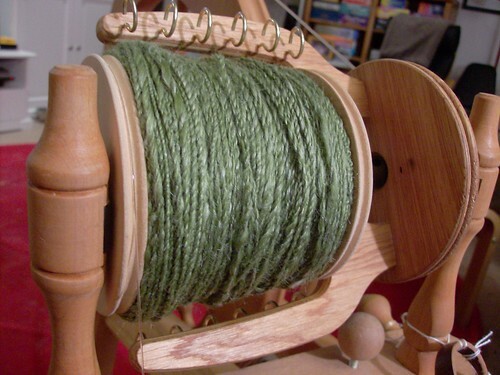 And is the handspun color closer to the bobbin pic? Or the high-contrast sofa pic? Bot colors would be lovely, but they sure show up different!